Today was one of the best days I’ve had in ages. Anniversaries, boyfriend, nephew, whatever to all that stuff….! Today, I met Garth Nix. And it was fantastic. Nix’s Old Kingdom trilogy was the first high fantasy series I read, and one of the first fantasy, and it has remained lodged in my consciousness ever since. Although I don’t tend towards favourites, if pressed for a favourite author, Nix would probably be it, and he has been for the last ten years, or possibly more. I know that when Abhorsen was published, it was very close to my birthday/Easter, and we had taken a trip to Achill (I think). I don’t remember properly, because I spent as much of the trip as I could buried in the book, devouring every word on the page. That was probably nine years ago? Although I don’t hold his Keys to the Kingdom or standalone books in the same excessively high regard as the Old Kingdom, I’m very fond of them. I also thoroughly approve of the KttK because they managed to stay in the same format for the entire publishing run, making them one of the only full sets of books I have which match. So last week, when I realised that Garth Nix was going to be in London doing a book signing, and giving away sneak previews of Clariel, which is an upcoming Old Kingdom book, I knew I had to be there. I was afraid briefly that I was going to have to skip out on lectures, but thankfully it didn’t come to that. I queued up for about half an hour to meet this man, and I was quite honestly delighted. He’s a gentleman and a lovely man, who signed my new book (A Confusion of Princes, being one of the few Nix books I didn’t already have) and engaged in lovely banter with me for a few minutes. I don’t think anyone could have a bad word to say about him. 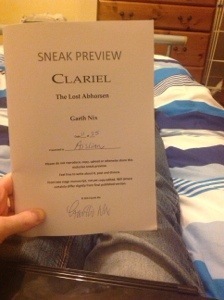 Equally exciting, though, is the fact that he gave me a preview of Clariel. I’ve been waiting for this book since before I knew it existed, and to get a sneak preview of the prologue and first three chapters is beyond exciting. I devoured it on the way home, and am only upset that there’s not more than three chapters there. I’ll just have to try and get my hands on an ARC next year. So yes. I will discuss the Clariel excerpt maybe another day. Today I’m just full of squealing and fangirling. My only regret is that I didn’t get there earlier – the first four people in line got bell charms. I would LOVE to have gotten one of those. Also signing at Forbidden Planet was Sean Williams, who has cowritten a series with Nix. I bought his book Twinmaker, which looks really good. He was really nice and really friendly, but he’s not Garth Nix, so I wasn’t as star struck at the sight of him. I’m still crazy happy with how today went, though. I posted last week about reading The Declaration by Gemma Malley. It’s the first in a trilogy, and I read the second and third shortly after, so I figured I may as well throw up an opinion on them, too. And they’re both by Gemma Malley too, shockingly enough. I read these both in quick succession, so the story of the two kind of blends together. I enjoyed them both, though! As with any dystopian trilogy, the later books expanded on the impact on a wider society of the particular dystopian trigger – in this case, longevity. We got to see more of the resistance, find out more about the company manufacturing Longevity and get introduced properly to the Big Bad of the series – Pincent, of Pincent Pharma, head of the company which manufactures the drug which necessitated the Declaration and the outlawing of procreation. I had relatively few complaints about this series. I did enjoy the trilogy as a whole. That’s probably because I like dystopia as a genre, though. Those complaints I did have: I kind of saw the end of the third book coming. There were two big reveals and I had them both pegged relatively early. The character of Anna, I felt, was done quite a disservice in the latter two books. In the first book she was afraid, certainly, and it took her a while to come around to the idea of freedom and agency and the value of human life, but in the second and third books she devolved into nothing more than Anna: mother. If cannot procreate, then have no worth. I found that disappointing, and it didn’t really do her character justice, I felt. Oh, and I suppose the books felt a bit simplistic, but I guess that’s what happens when you read children’s books as an adult, so I can’t really criticise them for that. Three stars for both books.